Shortly after we moved Gareth discovered my old Cabbage Patch dolls. 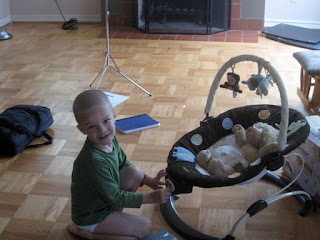 While he occasionally plays with the "baby" one, he's really taken to the "toddler" one. He started referring to it as his brother and decided it should be named Lightlipe. Strange, yes, but more creative than me, who always referred to the doll by the name it came with. Well, sort of. The name it came with was Majestic Tiffany. Even as a young kid I guess I thought Majestic was just strange for a name, so the doll was always called Tiffany. But now it goes by Lightlipe. Lightlipe has come for rides in the car and came outside to play a couple times this summer and frequently has to be tucked in bed beside Gareth. Poor Lightlipe's clothes from the '80s aren't quite cutting it anymore (the pants just fall right off all the time), so I'm planning on attempting to make some new clothes for the doll at some point. You can still find a few patterns for the dolls online. Anyway, a mom in our co-op is getting rid of some of her baby items and since we didn't have much of anything from Gareth I took her up on her offer to pass them on to me. She told me the batteries on this seat thing were probably low because her girls constantly turned it on and played with it. Sure enough, within seconds of seeing it Gareth was turning it on and putting together the bar for the animals, and putting the animals on. He was pretty bummed when I told him he was too big to sit in the seat himself, but soon found that Lightlipe works great. I think it's pretty cute how much he likes to take care of his doll. Hopefully he'll be interested in entertaining a real baby in a few months after he discovers how much they cry, how much attention they require, and so on. That's very cute. Sylvia used to put her doll in Paul's swing, though she also tries to climb in all the time. Fortunately, it's relatively sturdy so it hasn't died yet. 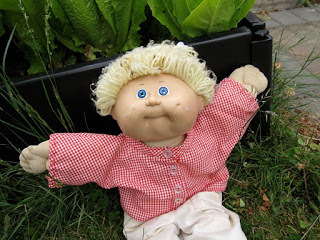 I don't think my cabbage patch dolls were in such good shape five minutes after I got them. I'm impressed!